On Feb. 5, staff from the Office of Equity, Inclusion & Multicultural Affairs hosted a presentation called “Slavery in Libya & Beyond.” This presentation was about the recent discovery of a slave trade that was reported in Libya by the IOM. 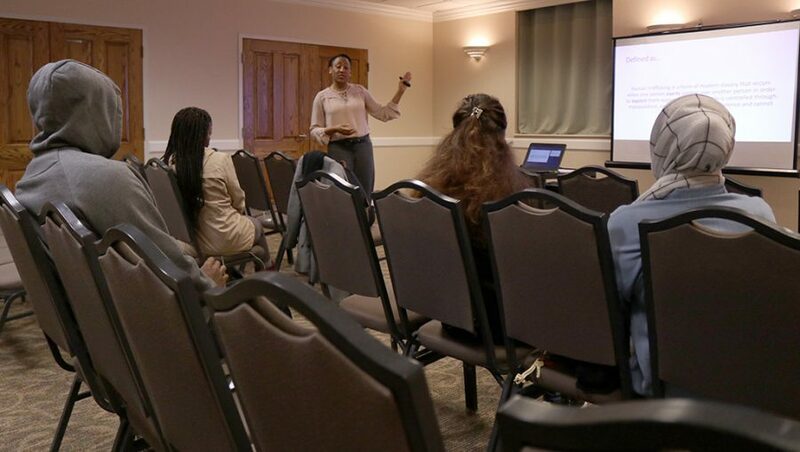 Syreeta Greene, director of Equity, Inclusion, and Multicultural Affairs said the purpose of this presentation was to inform the students what is going on as it relates to Libya in the slave trade. Kelsey Purcell, mass communication senior, said that she was saddened by the fact that slavery is still an issue in our world. Greene said this slave trade in Libya is caused by the migrant crisis where many migrants, asylum seekers and refugees from Sub-Saharan, Africa go through Libya and the Mediterranean Sea to settle in Europe. Greene also said the European Union trying to deny entry to Europe is leaving many of these migrants stuck in Libya where they become more vulnerable to exploitation and modern-day slavery. According to Greene, the mainstream media is not focusing enough on international affairs, especially in Africa, which is one of the main reasons why people are unaware of what is happening in Libya. Purcell said that the lack of awareness is due to people not being able to empathize with those in modern-day slavery. Greene said one way students can fight modern-day slavery is by raising awareness. Conney Vargas, mass communication senior, said hearing about the slave trade in Libya reminded her of the times where slavery was legal in the United States. Contrary to popular belief, Greene said that the slavery is still legal in the United States. Those incarcerated are exempt from the 13th Amendment of the US Constitution. Vargas said that her buying habits are a contribution to labor exploitation and modern-day slavery. She also said that making drastic changes can be very hard for many people. According to Greene, the rise of free trade has contributed to labor exploitation and modern-day slavery. Greene said that many multinational corporations operate in countries without labor laws to make the most profits that they can. To combat modern-day slavery, Greene said that students must be aware that it exists. Modern-day slavery can also be fought by students changing their buying habits. Asma Mohammed, radiology sophomore, said this presentation made her more aware of why it is important to know how she is financially supporting modern-day slavery. Vargas said that she has learned how important it is for her to be informed about international affairs. She also said that she will not shop for diamonds. Greene said the presentation was very successful because it raised awareness about modern-day slavery. Mohammed said she has learned a lot from this presentation, despite believing that she was well-informed on modern-day slavery. Purcell said enslaving another human being is the worst thing one can do to someone. “Slavery is an ugly, disgusting, vile thing that should make all of humanity question how we allow something like this to happen,” Purcell said.